Polyethylene and polypropylene are two enormously important materials on the market. The fact that their use continues to persist despite legitimate environmental concerns is a testament to how useful these materials have become over the years. Polyethylene and polypropylene can be thought of as polymers of the very simple alkenes, ethene and propene. In fact, that's exactly where these materials come from. Unlike other polymers of alkenes that we have looked at, polyethylene and polypropylene are not polymerised via cationic methods. Instead, these monomers are enchained through a process called "Ziegler-Natta polymerisation." This process is named after a German and an Italian chemist who are independently credited with its development in the 1950's. In Ziegler-Natta polymerisation, monomers are treated with a catalyst, such as a mixture of titanium chloride (or related compounds, like oxovanadium chloride) with triethylaluminum (or trimethylaluminum). Other components are often added, such as magnesium chloride, to modify the catalyst and improve performance. The mixture described here produces a heterogeneous catalyst; it is an insoluble solid. Now, the catalyst isn't really titanium chloride, because all of these components react together to make something new. Exactly what they make may be hard to determine. It's a complicated gmish. Despite the complicated catalyst mixture, we do know a little bit about the mechanism of reaction. Partly this information comes from studies of model compounds. Model compounds are simpler than the industrial catalysts, but they still have some structural features in common with their hard-working cousins. They have enough in common to be able to carry out polymerization catalysis, although maybe not as well as the industrial heavyweights. So, what do we think happens? It seems pretty clear that one of the things that the trialkylaluminum does is provide an alkyl group to titanium. That shouldn't be too surprising. The triethylaluminum, like ethyllithium or ethylmagnesium bromide, ought to be a source of nucleophilic ethyl groups. The titanium tetrachloride ought to be a pretty good electrophile, complete with halide leaving groups. We can imagine at least one of those chlorides getting replaced by an ethyl ligand. Provide a mechanism for the ethylation of titanium tetrachloride with triethylaluminum. The next step, presumably, could be the binding of an alkene ligand to the transition metal. Now we are looking at an organo transition metal compound. We should be thinking about organometallic reaction mechanisms. For example, a 1,2-insertion of the alkene into the metal-carbon bond would provide a new metal alkyl. From there, and using these same elementary steps in succession, it is easy to imagine how polymerization of propene might occur. Bnding of an additional alkene, followed by the 1,2-insertion of the propene into the metal-carbon bond, results in formation of the propene dimer (with a methyl end group). Let's pause for a moment and look a little more closely at the role of the aluminum compound. This topic is peripheral to electrophilic addition although important to the subject of catalysis. In catalysis, "promoters" and "supports" are sometimes added to improve catalyst function. They might do so in a number of ways. They may take part directly in the reaction, providing additional Lewis acidic or Lewis basic sites, in much the same way that amino acid residues surrounding the active site of an enzyme may help catalyse a reaction. They may play a more subtle role, affecting physical properties of the catalyst (such as its solubility) or even tuning up the chemical properties of the catalyst. For example, maybe the promoter adds a little more electron density to the catalyst, making it a little less electrophilic. That might make the catalyst more stable; maybe it becomes more selective, reacting more carefully instead of with wild abandon. Maybe it makes the catalyst last longer. Although classic Ziegler-Natta polymerization involves heterogeneous catalysis, lots of variations have been developed, including model systems to study the basics of the reaction as well as other, working homogeneous catalysts. One very successful variation, developed by Walter Kaminsky at University of Hamburg, uses Cp2ZrCl2 as catalyst and methylalumoxane (MAO) as a promoter. 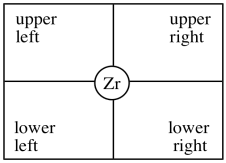 This zirconium species, in which the zirconium atom is wedged between two cyclopentadienly ligands, is commonly called a "zirconocene". MAO is another poorly-defined species. It is obtained by treating trimethylaluminum with a trace of moisture. If you remember anything about Grignard reagents or alkyllithiums, you might think that isn't such a good idea. In truth, it is an even worse idea with trimethylaluminum with either of those other two metal alkyls. The trimethylaluminum is quickly decomposed into something else, a poorly-defined species called "methylalumoxane". What we know about the structure of MAO may be a little bit fuzzy. Once again, some light can be shed on the subject via model studies. In some beautiful work done in Andrew Barron's lab at Rice University, alkyl aluminum oxide clusters were obtained via the careful treatment of tri(tbutyl)aluminum with water. Aluminum oxide clusters resulted, containing two, three, four or six aluminum atoms, depending on the reaction conditions. A drawing of one example, a hexamer, is shown below. Some of the alkyl groups have been replaced by oxide ligands. We can imagine something similar would happen with trimethylaluminum. The aluminum forms bonds with oxygen, which bridges between different aluminum atoms. The structure is probably oligomeric itself, forming large clusters of aluminum oxide, although it must retain some methyl groups as well. Provide a mechanism for the formation of an oxy-bridged aluminum dimer via treatement of trimethylaluminum with water. Why does tri(tbutyl)aluminum with water produce well-defined structures, whereas trimethylaluminum with water leads to a mess? Just as in the original Ziegler-Natta catalyst, the "extra stuff" plays an important role. The MAO may tune up the qualities of the zirconium catalyst, in addition to providing an alkyl group. Kaminsky's "zirconocene" catalysts are used commercially to produce polypropylene. They have been particularly important in developing ways to control the stereochemistry of the reaction. Consider a polypropylene chain. Each methyl group that hangs from the zig-zagging backbone of the polymer could have two possible orientations. It could be coming forward, shown with a wedge. It could be going backward, shown with a dash. The stereochemical relationship between those wedges and dashes is called "tacticity". Tacticity basically comes in three flavours: random, alternating and same. A random stereochemical arrangment is described as an "atactic" polymer. 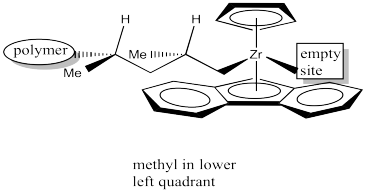 If all the methyl groups are on the same side in a regular zig-zag projection of the backbone (either all wedges or all dashes) the arrangement is described as "isotactic". If instead the methyl groups alternate (wedge-dash-wedge-dash), the arranement is called "syndiotactic". One of these catalysts (C2 vs. Cs) is chiral; the other one isn't. Which is which? Let's look at the C2 catalyst. We'll strip it down to just the zirconocene part, leaving off the chlorides. The chlorides are likely replaced by methyl groups or else lost via dissociation (presumably leaving Cp'2ZrCl+ ion). We will rotate the catalyst fragment to look at it from the "front": the more open part of the zirconocene "wedge", which is the direction from which a newly coordinating propene would approach. Here is the view from in front of the wedge. This is the surface that the propene will interact with as it approaches. In our discussion, we will use "quadrant analysis", a standard tool for trying to analyse stereocontrol in transition metal catalysis. In quadrant analysis, we try to imagine differences in steric barriers in each of four quadrants around the metal centre. How will the arrangement of bulky groups influence the approach of a substrate? In the C2 catalyst we are using, it looks like there will be more room in the upper right and lower left quadrants. The upper left and lower right are blocked by those rings. When the propene is approaching, the polymer chain will present the largest obstacle, because it is extending a significant distance away from the zirconium atom. To minimize steric interactions,the chain may extend into the relatively empty upper right quadrant. Alternatively, the polymer change could extend into the relatively open lower left quadrant, but that would really give us the same drawing, just rotated by 180 degrees. Make a drawing of the complex with the polymer in the lower left quadrant. As we think about bringing the propene into the empty coordination site next to the polymer chain, there are two questions we need to consider about orientation. The first is about which end of the alkene to bring into the wedge. The propene has two different ends: one end sports two hydrogen atoms, whereas the other end has a hydrogen and a methyl. It seems likely that the propene will fit best if the narrow end, the one with the two hydrogen atoms, extends into that narrow wedge. Now we need to think about which of the propene's two faces will coordinate to the zirconium. To think about the faces of propene, hold your hand out flat, with the thumb forming a right angle with the rest of your hand. The back of your hand represents one face of the propene; the palm of your hand represents the other. The propene will enter in such a way as to minimise steric interactions. It looks like the easiest way is as shown below. The methyl group is placed in the lower left quadrant. You can think of it as keeping the methyl group away from the upper ring or keeping it away from the polymer chain, which is also in an upper quadrant. If your left hand is propene, we have coordinated the back of your hand to the zirconium, with the thumb pointing down. If we had coordinated your palm, the thumb would be pointed up. Once again, if we started with the polymer in the lower left quadrant, the entire drawing just rotates 180 degrees. It is still the same face that coordinates (the back of your left hand). Make a drawing of the complex with the polymer in the lower left quadrant and the propene coordinating to the right. The next event is 1,2-insertion of the alkene into the metal-alkyl bond. That leaves us with the following structure. Notice that we have formed a new stereocentre. Because the methyl group of coordinated propene was pointing down, and the hydrogen adjacent to it was therefore up, then in the new stereocenter the methyl is still in the lower of two possible positions and the hydrogen is in the upper of two possible positions. Furthermore, the methyl is pushed back and to the left because the alkyl came from the right. In order to help keep track of that insertion step, here is a drawing with colour labels. The narrow end of the propene is now attached to the zirconium via a sigma bond. The wider end of the proene has formed the new chiral center. The carbon that used to form a sigma bond to zirconium is now just another carbon along the growing polymer chain. The youngest part of the polymer is found at the growing end. When another propene approaches to occupy the empty position, it will coordinate using the same face as the previous propene. The 1,2-insertion produces a new chiral centre. The C2 catalyst is producing an isotactic polymer chain. The is an example of "site control" of polymerization. The chiral C2 catalyst has influenced the stereochemistry of the growing chain. Assign configuration (R or S) to each of the chiral centres along the polymer chain in the above drawing to confirm isotacticity. Keep in mind that "polymer" stands for a long chain of carbons. Now let's look at the Cs catalyst. We'll strip it down like we did before. Where will a growing polymer chain go? Obviously it should go into one of the upper quadrants. It isn't obvious whether it should be upper right or upper left. This time, it makes a difference, because the picture would not be the same. Draw the catalyst site with the polymer chain in the upper left quadrant. However, once the propene approaches, a clear preference occurs. The chiral centre on the polymer chain is shown with the hydrogen up towards the Cp ring, since it is small and won't cause too much steric interaction. The polymer chain is extending forward, into the big, open space of the wedge. The leaves the methyl pointing to one side of the wedge. Which way will the propene approach? Will it come in on the same side as the methyl, or the opposite side? Probably the opposite side, as shown below. Researchers suspect the methyl group points "down" in the above drawing, rather than "up", because the polymer chain is a bigger steric obstacle than the lower aromatic ring, and the polymer chain is in an upper quadrant. Once again, the approach of the propene is sterochemically controlled, although this time the stereochemistry of an existing chiral centre in the growing polymer chain influenced how things proceeded. Once again, upon 1,2-insertion, a new chiral centre is formed. The Cs catalyst is forming a syndiotactic polymer chain. Because of the influence of an existing choral centre on the stereochemical outcome of the reaction, this catalyst is considered to work through "chain-end control". The catalyst site simply amplifies the influence of that chiral centre upon the chiral centre that forms next. It does so by bringing the reactants together into a small space where the steric differences of two subtly different pathways become more important. Label the configurations (R or S) of the chiral centres in the above drawing to confirm syndiotacticity.